Buy our human-verified Canadian pharma mailing list to cure what ails your B2B marketing campaign! With business email lists like this Canada pharmaceutical email database, you can easily reach out to those who are most likely to purchase your product. Our Canada pharma email list includes the contacts you need to expand your marketing influence. When you buy a Canadian pharmaceutical industry mailing list from Bookyourdata.com, we make sure the list is up to date and verified, and each business database we sell includes all of the detailed information you need to connect with highly qualified sales leads. When you buy this pre-built Canadian pharma email list, you'll receive important direct contact information including email addresses, phone numbers, postal addresses, and fax numbers for those who work in the pharmaceutical industry in Canada. 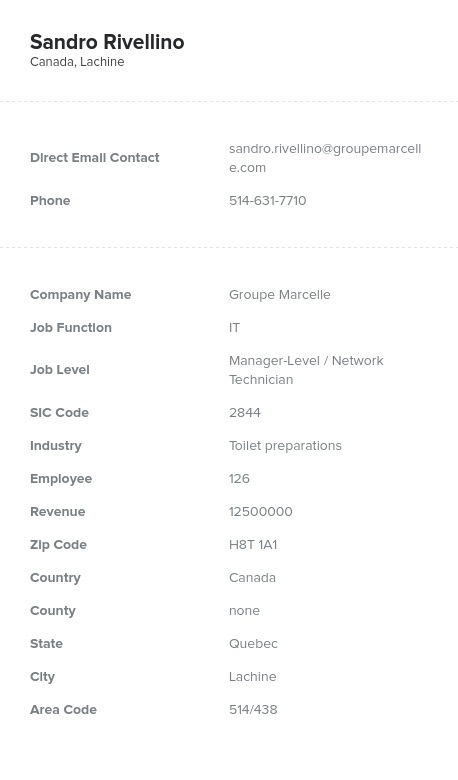 You can download this accurate B2B Canadian pharma email database in just minutes and start focusing your marketing efforts, whether you choose to email leads, send direct mail, or cold-call contacts. For a more targeted approach, you could also use our custom list-builder tool to create a Canadian pharmaceutical industry email marketing list that's specifically tailored to your needs, whether you want to reach out to chemists in British Columbia or production managers in Ontario. Our affordable Canadian pharma email database will help you build stronger business relationships with your customers and save you time in the process. Purchase this Canadian pharmaceutical email list today to find great business contacts and boost the health of your business!